It was a pleasure to read this piece. For the past 6 years I’ve run a non-profit called HotFutbol, working in Port Au Prince and other areas in Haiti. My perspective about the game and life in the developing world is refreshed each time I walk onto the field in Haiti. The children we meet and work with are passionate about the game, and thoroughly welcome us into their world. At the same time we are regularly reminded that kids are the same the world over, and that soccer is a language spoken in every culture. When I return to my D3 guys at Westfield State University, I arrive with a larger sense of possibility and an awareness of all we have in this culture. When we get water I smile, knowing this is something we take for granted in the first world. When we lace our boots I look back at the barefoot players I’ve seen on the island. Our bag of fresh, inflated practice balls is a treasure elsewhere, and a second thought here. When my guys hear about it they begin to understand the gift they have; to see the opportunity on the field as something special; and to hold their place in the classroom as precious. Thanks for the comment! It’s a blessing to educate college students about what is going on in this world. Some students take so much for granted, and if we can open their worldview just a crack I feel like we’re making a positive contribution to their lives. Thanks for the work you’re doing in Haiti! Thanks for your kind words. You’re right about the worldview piece. It’s very important. If you ever want to make another interesting trip and have the time, let me know. 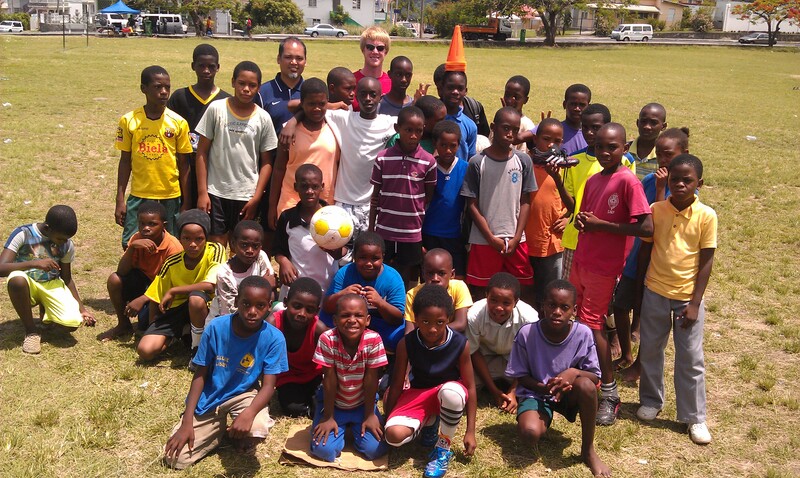 Take a look at http://www.hotfutbol.org, or the Haitian Initiative on Facebook. The fun never stops. Good to know that it was a meaningful time for you, and that lives were influenced by your passion for God and soccer.